She caught me red-handed and I was mortified. That’s why I’m here: to tell you about it. I’m not a recurring character, or anything and I really didn't have a sordid affair. No, I’m one of Charlotte Adams’ clients. The thing was I had a brand new beautiful condo and a new husband too. Life was perfect except that the contents of two kitchens were mashed together when we moved in together. So my house was perfect (a dream come true), but when you opened a cupboard door in my designer kitchen , you were taking your life in your hands. My husband never met a spatula he could live without. Yogurt containers and pot lids were multiplying. Tempers flared. With all those sharp knives and flaring tempers, cooking was anything but relaxing. Then I found Charlotte Adams. Yes, she’s a little bit like a tiny well-groomed general (great shoes), but she gets the job done. I’m a business woman. I like that. 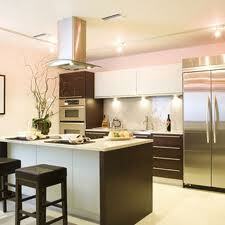 Nothing rested on or above my beautiful quartz countertop except a stainless steel range hood. The undermount sink was also stainless, and my cooktop blended into the counter. Nothing cluttered those sparkling surfaces. I was proud of the kitchen. So, of course, it was embarrassing when Charlotte found my dirty little secrets. She checked out the cupboards and a stack of plastic containers landed on her feet. Crash, bang, blush. That was nothing compared to how I felt when she opened my imported European oven and found … my dishes from the day before. Appearances are not everything, it seems. Caught! I liked how she listened to what I needed, but pushed back just a little bit. After all, I was paying for change, not to keep the same old problems. She did arrive with her helper, Lilith (what bright hair!) and a stack of bins. I liked her system: Keep, Sell, Donate, Toss. Charlotte taught me to keep what’s loved and useful and to be ruthless with the rest. She told me I’d love the results and she was right. 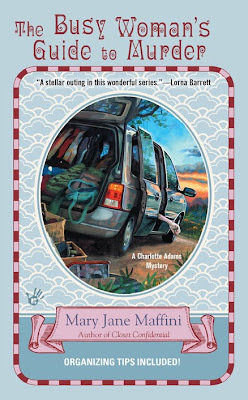 The whole organizing project is detailed in The Busy Woman’s Guide to Murder including Charlotte’s best tips for me. I feel like I’m starring in a reality TV episode! My pared down kitchen works like a dream and my husband and I can cook together without fear of meltdowns and cascading cookware or worse. Mind you Charlotte did get a bit distracted when all those women were being killed by hit-and-run drivers, but she never let me down. And she still cleared up those murders. The town is a lot safer, even if the police do look like they’ve been sucking lemons. Do you have an organizing project? Or pesky murders in your neighborhood. I’m betting Charlotte’s the gal for you. I sure got my money’s worth. And please let me know if you need six extra spatulas! 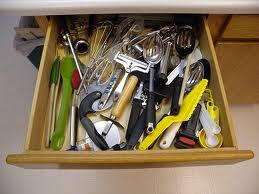 That drawer doesn't look so bad, Hannah. Maybe it's the after picture? Oh dear, oh dear! Where are you, Charlotte? Oh, no, Charlotte is NOT getting into my kitchen!! How would I explain that even though I can't use the vintage utensils that clutter my drawers, they're not going anywhere. Maybe she could help me figure out how to display them? Janet, I could use a little Charlotte here too. I considered taking a shot of my own utensil pitcher, but saw the light in time. Victoria: Charlotte would probably have them as wall decorations and in shadow boxes. I love old utensils, and not just my sixties Tupperware. I'd love to have a Charlotte in my house. I could keep her busy until Christmas. And, I'm sure there'd be a lot of laughter involved. The neighborhood's fine though...no murders as yet. Don't feel bad, Hannah. I need Charlotte to come visit my tiny house. I have far too many drawers that look like that one and then spill over bins for the rest of the stuff. Whenever anyone comes to visit from out of town we go through and toss. I suppose I need to start inviting more people over! I need Charlotte here too, Erika, and I should know better. I like your solution, Dorothy. You get to socialize - hmm. I could do that and send everyone home with yogurt containers and bent forks. I could use Charlotte's organizational skills, but do I need to drum up a body too? We supply the bodies, Liz!